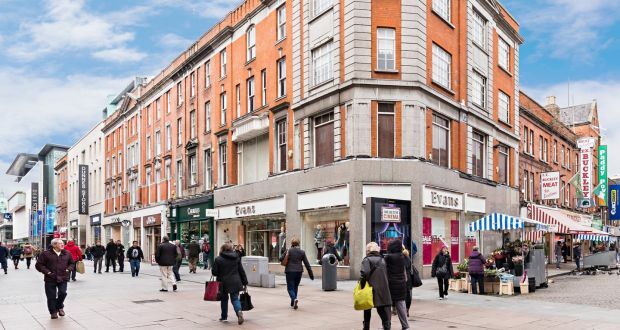 Dublin’s strongly performing Henry Street is once again to be the centre of attention for investment funds with the forthcoming sale of the retail premises at 42-43 Henry Street occupied by the women’s fashion outlet Evans. Kevin McMahon of Savills is guiding €18 million for the investment which will show a net initial yield of 4.60%. The building at the corner of Henry Street and Moore Street is let in its entirety to the Arcadia Group at a rent of €865,000 per annum. The 35-year lease from 1985 has 3.6 years to run. Henry Street yields have been correcting in recent years in response to buoyant trading, limited investment opportunities and significant capital appreciation. In September, 2014, Irish Life settled for an income yield of 3.95 per cent when it outbid several high-profile funds to buy four adjoining buildings at 18-21 Henry Street for €34 million. Nine months later the institution acquired two further buildings on Henry Street (numbers 51 and 52) as part of the €154 million Sovereign portfolio. Last October it was the turn of Friends First to grab the headlines when it accepted an income yield of 4.25% after buying the telecoms shop 3 at 35 Henry Street for €9.5 million. In another high-profile sale involving 23a Mary Street, a private investor settled for a yield of 4.8% when paying a €4.95 million for 23A Mary Street. The latest investment to hit the market, 42-43 Henry Street, is a four-storey over-basement terraced corner building with an overall floor area of 961 sq.m (10,342 sq.ft) including 260 sq.m (2,800 sq.ft) at ground-floor level. Only a limited number of buildings on the street can provide this scale of accommodation. The ground, basement and first floors are in retail use while the upper floors are utilised as offices, storage and ancillary accommodation. The building has 14.5m of frontage on to Henry Street and a further 12m return on to Moore Street. Evans is a particularly well-known fashion retailer, forming part of the Arcadia Group which has 45,000 employees operating more than 2,500 stores. Kevin McMahon says 42-43 Henry Street offered a unique opportunity for both domestic and international investors to secure a high-profile retail investment with numerous asset management initiatives on one of Ireland’s premier streets. Dublin’s retail sector had witnessed a significant turnaround in recent years with a growth in jobs and retail sales attracting in top international brands such as Ann Summers, Victoria’s Secrets, Hugo Boss, COS, “& Other Stories”. This had led to strong rental increases and a scarcity of good quality space. He said investors in 42-43 Henry Street would have the opportunity to obtain a very secure income stream for the next 3.6 years until lease expiry and could then capitalise on the pent up occupational demand for prime high street pitches.